Hey everyone – well we are giving the Kickstarter another go! 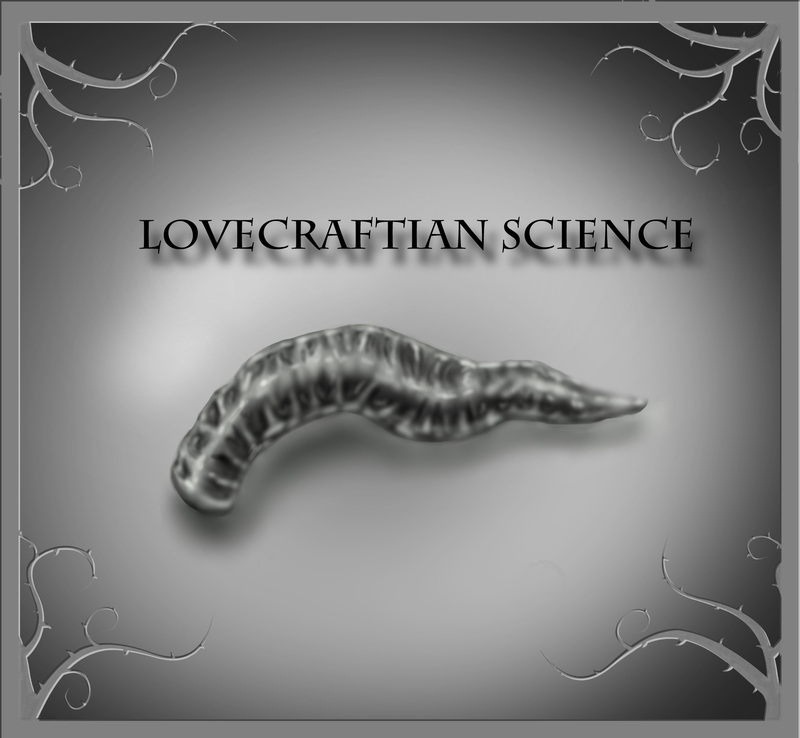 This time we are offering both digital and print versions of the Journal of Lovecraftian Science, Volume 1 plus a shorter tome on the biology of the Elder Things! If you are interested, please check out the Kickstarter at: https://www.kickstarter.com/projects/1081353216/journal-of-lovecraftian-science-volume-1. The next article to be posted will be a discussion on what was known about radioactivity in the early 20th century when HPL wrote “The Colour Out of Space.” Thank you – Fred. Well the Kickstarter was not successful but I do want to thank everyone who contributed toward it. It was a learning experience to say the least. I probably did the dumbest thing you can with the Kickstarter and that is starting the campaign just before Thanksgiving and having it proceed through the Holiday Season. It’s not surprising that the number of people who signed on increased dramatically after New Year’s (people are busy over the Holiday Season!). Second, a lot of people asked for a hard copy of the document so I am looking into producing a 48 page chapbook of Volume 1 and offering it as part of a future campaign. Thus, if you are interested in a copy of Lovecraftian Science, a second attempt will be made sometime over the next few weeks. I do want to thank everyone who supported the first campaign, including Mike Davis at the Lovecraft eZine and Niels Hobbs, founder and coordinator of the 2013 and upcoming 2015 NecronomiCon. To other people, such as Scott Jones and Joe Kontor and many, many others include many people on Facebook, I thank you as well for your support. Again, thank you one and all – Fred. Also, I did want to thank everyone who has contributed toward the Kickstarter to date. Shown below are two more illustrations from Steve Maschuck. 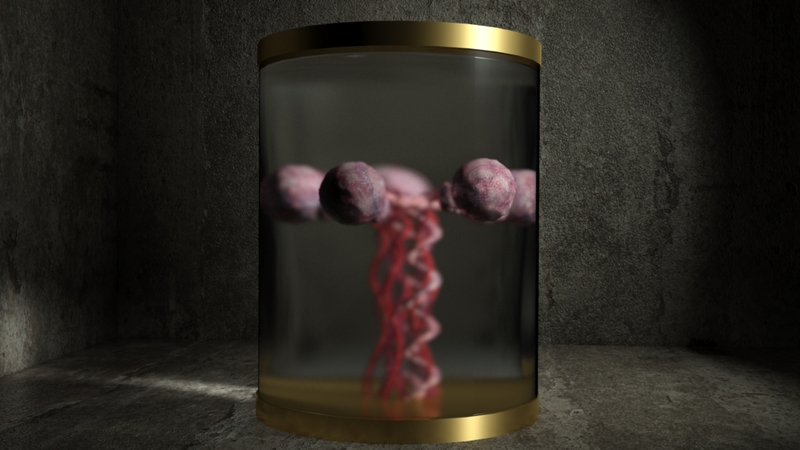 The first is a set of human brains in Mi-Go cylinders, while the second is an Elder Thing brain being prepared for a Mi-Go cylinder. Thank you! Fred. 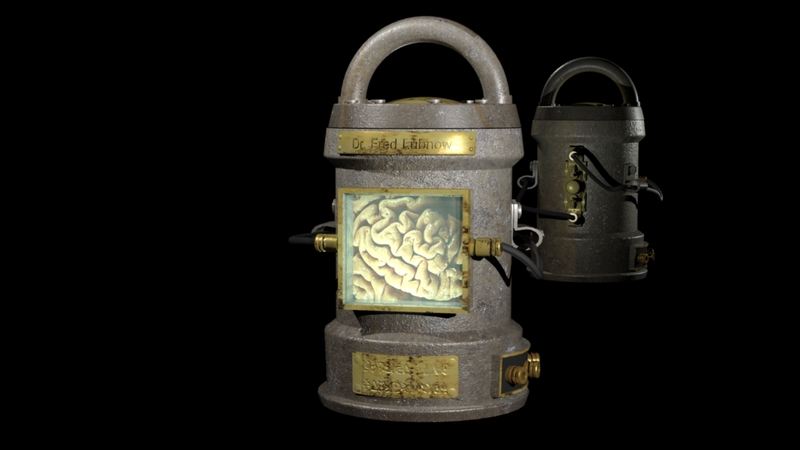 Human Brains in Mi-Go cylinders. 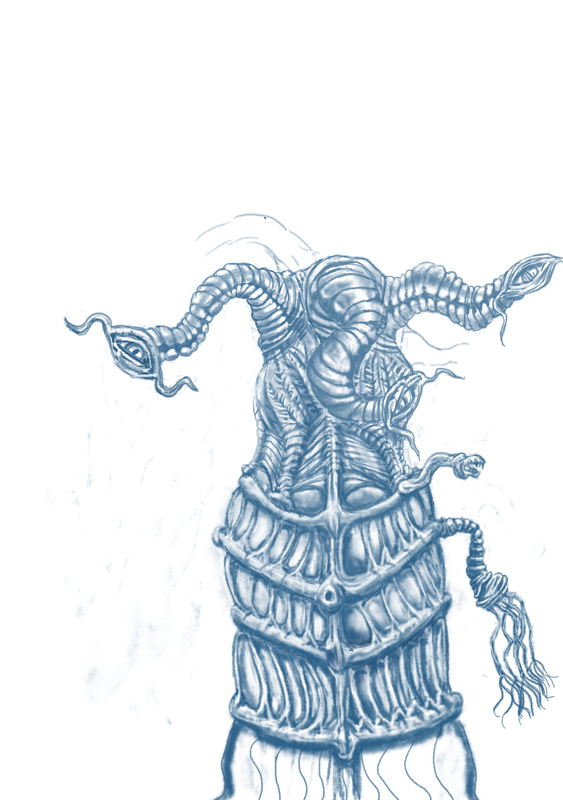 Elder Thing brain being prepared for a Mi-Go cylinder. Thank you! 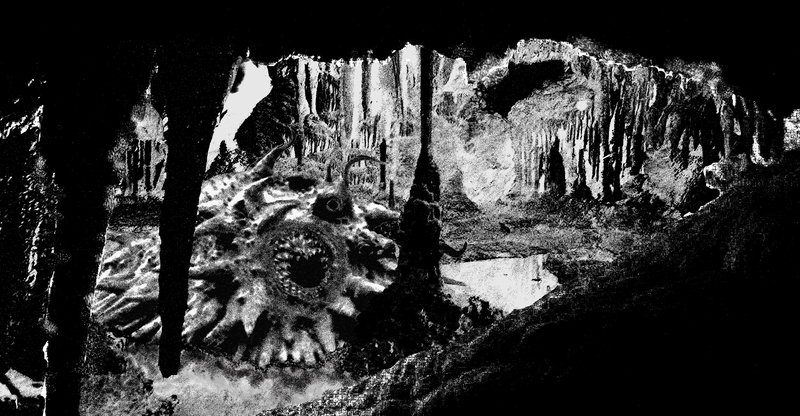 Shown below is an “old” shoggoth under the Mountains of Madness, by Steve Maschuck. Hey everyone – just wanted to let you know that there is an updated illustration on https://www.kickstarter.com/projects/1081353216/lovecraftian-science-volume-1. 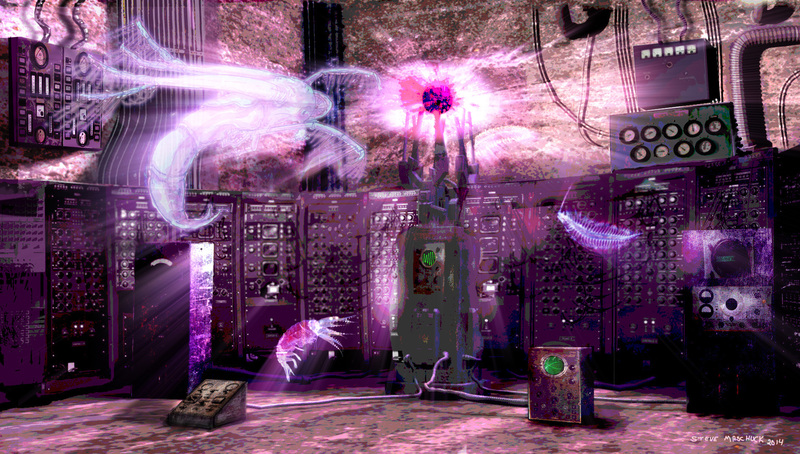 If you are interested in more Lovecraftian Science, please consider contributing to the Kickstarter for an electronic version of Volume 1. Thank you – Fred.